If you were paying attention (and it’s not a judgment upon you if you weren’t), you might have noticed that I did not post last Sunday. This was inadvertent. 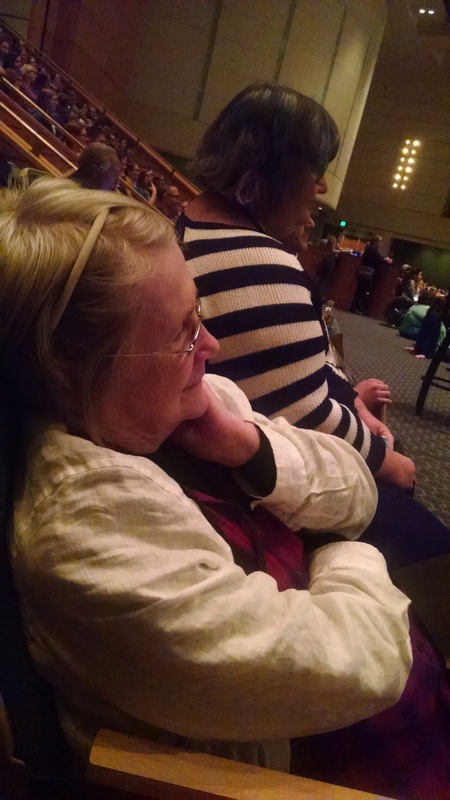 The previous week I made a spontaneous decision to attend NerdCon: Stories in Minneapolis with a dear friend who recently moved back to the Twin Cities. The running theme was Why Stories Matter. I am not going to give you a review of the con. (For that you can go to John Scalzi.) I am going to tell you why being there mattered to me. NerdCon:Stories was held all day Friday and Saturday. I took a day of PTO (paid time off, the privilege of a full time employee, which I have had just less than a year) to go. It was a fantastic experience, but last Sunday I was just not able to process it all into a post worth sharing. NerdCon:Stories was the work of John and Hank Green, better known from their YouTube channel as the vlogbrothers. Originally intended as a one year challenge to get the two brothers to communicate more often, it is essentially two siblings talking to each other about what interests them in a publicly accessible forum. On the vlog the brothers discuss issues of the day, explain things, and are generally boisterous, playful and funny. They are, in the best sense of that hitherto awful portmanteau, edutainment. And they are hugely popular. The videos have an arbitrary format of under four minutes, with which can makes for some frantic editing. See, for example, Hank’s post-mortem on the event. Yes, those are men with six packs. None of them were present at NerdCon. If you are more in tune with the world of literature than the world of online video, you may know that Hank’s brother John Green wrote the (take a deep breath while I pile on the adjectives here) New-York-Times-bestselling-young-adult-novel The Fault in Our Stars, which became a movie in 2014. And a few other very well received books. So he, too, has a pretty deep commitment to stories. A former public media colleague of mine (also at NerdCon) introduced me to the Greens and their vlog. I knew of John Scalzi, because the friend I attended with had recommended one of his books (Red Shirts). I knew local slam poet and rapper Dessa Darling and MPR’s John Moe, who hosts the radio variety show Wits. But almost all the other featured guests – literary, performance, online media – were entirely new to me. I now have an online list at my local library of about fifty new books. Not to mention a few new podcasts and YouTube channels to follow. I have to say that compiling a book list by listening to authors talk about their work, their enthusiasms, their ethics and their art first – rather than coming because you are already a “fangirl” – is a pretty good way to go. Watching them play games and act in puppet shows together doesn’t hurt either. 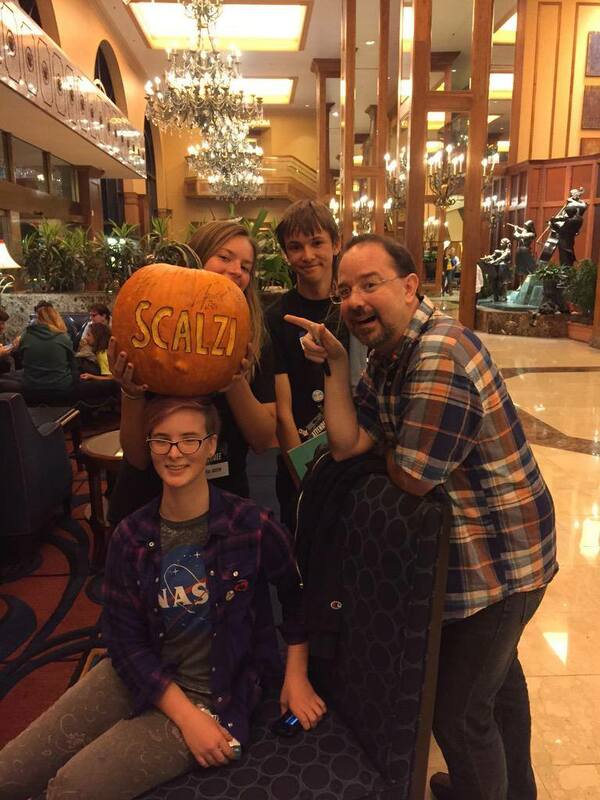 I liked John Scalzi even better after his death by voodoo pumpkin – and when he responded to a photo I tweeted of two girls I met in the lobby who had collected that pumpkin and wanted him to sign it – well, I liked him even better than better. I went to NerdCon with my friend Ann. It is unlikely anyone would mistake either of us for fangirls, though I did color my hair purple for the occasion. Ann is in her early seventies. Her story Saving Pagan Babies was the title piece in a collaborative Fringe-style performance on [Roman] Catholic culture clashes we did together in 2009. She is one of the smartest, funniest, bravest people I know. Ann spent the last four years in in Colorado, caring for dementia-ridden parents, a decision that was about as voluntary as Jane Eyre’s decision to become a governess. To neither of us was the recession kind, but I had a few more options. Her friends have been plotting her extraction for some time. I had been trying to get together with Ann since her return in September. When she said she wanted to go to this, I jumped at the chance to give my inner nerd a spin. Ann was ready to spend time with young people and fresh ideas. In the lobby she told M. T. Anderson, whose young adult novel Feed is now on my bedside table, that she chose this event over her 50th college reunion. Why did she do this? Because she’s awesome, that’s why. This is a tiny little WordPress platform, but I am typing as loud as I can, universe: listen up. I think I’d rather go to that convention than my 50th reunion too! I wish I had known about this conference, Paula. I’m just across the border in neighborly Wisconsin. Maybe next year! Minneapolis does such great things for writing, but I was so busy working when I lived there…sigh. I won’t give up moose in my garden for nerds in convention, though, but I should seriously plan a writer’s fun week back your way sometime! Great convention, and great review of it. This sounds like so much fun! 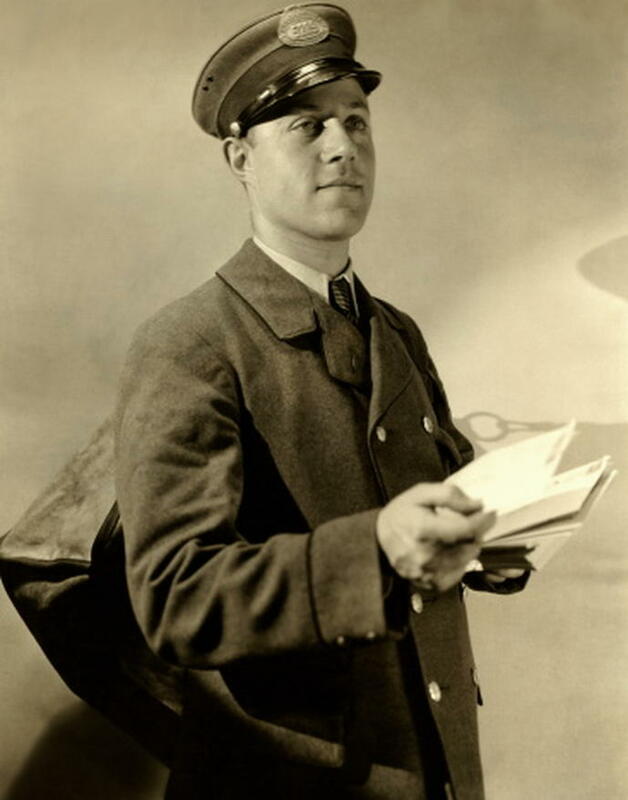 Your post ended much too quickly. I wanted more. But I have now watched the two videos, and been introduced to authors I didn’t know before, and….. So good, Paula. Thanks! Oh — and I love that you went with purple hair, too. So, so envious! Though happy for you, too. Sounds awesome (as it should be). :-) Fangirling for sure here but…John Green and Scalzi! Also, love that you dyed your hair purple. I’m always in favor of purple hair.